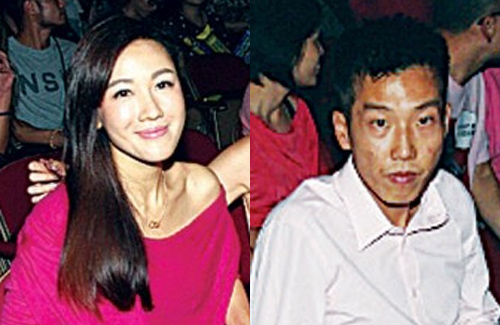 Selena Li Falls for Real Estate Broker? Possessing a gentle and sweet demeanor, TVB actress Selena Li (李施嬅) has had many pursuers through the years. Despite placing more efforts in her relationships than on her career, the beauty queen had her share of relationship flops and has been searching for Mr. Right. At the beginning of the year, it was reported that Selena had broken up with her boyfriend and wealthy businessman, Christopher Hodgson (潘樹維). Selena was quick to find a new love and was reportedly dating a wealthy second generation bachelor, Felix Chow. However, it was later revealed that Felix actually has been in a stable relationship with his girlfriend for more than 10 years, forcing Selena back on to the dating market. Currently 35 years old, Selena may be anxious to start a family soon. Selena has been spending more time with Elaine Yiu (姚子羚) and her boyfriend Cheng Tsz Bong (鄭子邦) in order to meet new prospects. Due to Cheng Tsz Bong’s vast social circle of wealth second generation bachelors, Selena is hoping to expand her dating prospects. However, according to recent reports, Selena has already found her next target – a real estate broker in his mid-30s named Anthony. However, due to the instability of a new relationship, Selena has not come forward to acknowledge it yet. Still at the beginning stages, the couple is wary of being spotted out together. In order to spend time together and get to know one another better, the couple would invite a group of friends to social outings. Recently, Selena and Anthony, along with a group of friends, were spotted attending Aaron Kwok‘s (郭富城) concert. 35 comments to Selena Li Falls for Real Estate Broker? I can only say that she must have seen other qualities in this guy (like perhaps a very healthy bank balance) if she’s indeed in a relationship with him. He looks like a country bumpkin to say the least (most likely a very loaded one at that). @isay Yes, surely Selena deserves someone better looking than that! @went that’s very true. I know of many couples that are like that, not just on the girl side, but on the guy side as well – real good-looking dudes ending up with ugly old-looking hags. But I sincerely thought that Selena could have done better. Yeah…. I mean soooooo…many real life or celebs. so many mismatches. If you guys remember Mandy Cho, TVB pretty actress but hardly a lead but she is one of those prettier Ms HK and look at the hubby? Not old but I don’t know that face is just odd at first glance. Famous Wang Cho Lam? haha…. Come on, so it’s really ironic sometimes… Beautiful guys/girls might married a NOT attractive guy and uglier guys/women might get a pretty ones. haha lol… ODD BUT TRUE. @isay this guy has to be loaded. Feel like Selena should go foreign route a la Linda Chung & Eliza Sam. Surely there are more options in the Asian Western world than there are in the Asian Eastern world. @coralie agree on this one. maybe she should take a break from dating.. then she’ll know what she really want. @happybi At 35…don’t think she has a lot of time to take a break esp when it seems like she wants to find someone to start a family. I don’t think there are a lot of good, single wealthy bachelors at this age in HK or China, really. I def think she will find someone more compatible in the West who are less likely to discriminate against her age and they probably have better morals too. Her circle of friends is in the East. Well at least the 1 that meet her criteria. Wealthy bank account. She is 35 but she still look great to me. Im sure there are 40s establish men in HK who doesnt discriminate. I find 35 years old the new 25 years old back in the day. People are starting family later in life now. Most of Linda’s and Eliza’s friends now are in the East, but they still met their significant other in the West. **Although mainland China has a higher gender-difference ratio, so that discrepancy bodes well for women. Maybe in the near future, China will be a much better hubbie market. It’s already better than HK anyways. I know what you mean. But in the west have less of the healthy bank account candidate. And since she knows where the rich men hang out in hk its easier for her to search there. @coralie 35 isn’t young but ppl are getting marry later these days. I always think when one stop looking for love is when they will meet the person they are fated for. I know too unrealistic but I am a romantic at heart. Hopefully she will find the love she want as I do like her. Think she is pretty too. @coralie she has 5 years. Once she hit 40 she may need some help. But if she is healthy, it might not be an issue. Wishing her luck for sure. Like someone said she sees other good qualities in him (inner beauty). Could this be a very bad picture of him or he looks better in person? Some people are not very photogenic. Do you know what I mean? @dramas4me true.. could be a very bad picture… Nice seeing you again. @happybi Then it must be a very very very very bad picture lol. Cos he looks absolutely like those 50 year old uncles with bad skin and terrible haircut. @isay I think he badly needs a facial or a makeover. Boy if he’s really that rich then he should follow Raymond Lam foot step go get a plastic surgery after that you’ll see a very handsome Prince Charming. I have noticed all her ex boyfriend aren’t that good looking at all. I mean she’s pretty I think she deserve a better looking one. Look at Tavia she’s not even that pretty and she can find herself a Prince Charming. Lol. Maybe she needs go for a younger guy just like Tavia. She dated Patrick Tang back then who broke her heart. He is not good looking in my opinion but still lookable compared to the above picture. Looks is not important to her atm. Looks fade away n when we grow old we will all have the same granny look. So i think she is looking for someone who can look after her. Healthy bank account and is nice to her. @1nit yes I remember she dated Patrick for a little while and yes he’s ok looking. Well I guess if you’re being a gold digger looks don’t matter to them just like Gigi Lai she’s one of them that’s what other had say about her. I believe the comments about looks is surfacing mainly because it seems like she is going for a nice bank account rather than personality. Together with Nancy and Elaine, they have been targeting weathy men. Or at least the media make it that way. If the article didnt mention about money and talk about how they met and how nice he treat her etc… then the comments will b more positive. @1nit I have a thumb up for you here. I totally agree with you about most of the commenters here. If the tabloids are to be believed, Selena is a gold digger. It won’t matter if he’s old and/or ugly or from east or west. As long as he’s super loaded. Love or cherish her is secondary. @isay i hope that is not the case as I don’t see her as being a gold digger. If she was one, she wouldnt have wasted her youth dating Patrick before. Most news article like to paint her as a gold digger for sure but I just think she date people not just for the looks but for quality where they have the ability to take care of her. This homely guy is probably one of those whose criteria is ‘young and pretty’ for a mate. C’mon folks! Those are the looks of a new HK male-god. I would put him up there with other luminaries like Bobby AuYeung and Moses Chan.